Černé Pivo is Czech for Black Beer. It is brewed with a combination of Vienna, Munich, CaraBohemian and Carafa malts and a touch of Saaz hops. It is fermented with a house lager yeast. Anyone who has visited the famous U Fleků brewpub in Prague will recognize this swarthy brew as an honorable nod to its signature dark lager. Chocolate aromas greet you with a hint of roasted coffee and char slyly sneaking in. First sips reveal more of the roasted notes, with the chocolate flavors fading to the background. At only 4%, this beer is slightly lower in alcohol than U Fleků’s Flekovský Tmavý Ležák 13° and presents itself as a much stronger version than it really is. Simultaneously refreshing and satisfying, this American version is food-friendly, and could pair well with fare ranging from barbecue to brownies. Who says dark beers can’t be refreshing? 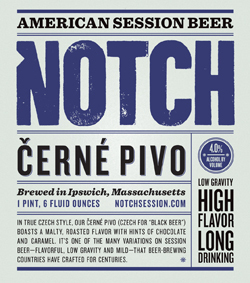 Notch’s dark Czech lager is loaded with roasted grain character, from the fresh chocolate and caramel aroma to the dry, smoky, chargrill finish. In between, malt brings both sweetness and bitterness, with a little caramel here, some dark chocolate there and always a whiff of smoke, but the key attribute is quaffability. A session beer, it hits the spot, light enough to keep you glugging, despite all that flavor. I could drink rather a lot of this!